This simple dish has an unexpected and delicious taste. Poor Russian peasants often created dishes that seem inedible until you try them. Murtsovka is one of those. In childhood, food is always more than just food. It is a way of experiencing the world, and the world has yet to fall into the categories we assign it as adults. One of the bright culinary memories of my childhood is connected with a dish my grandfather made again and again. It often happened that I had a cold or some other harmless childhood illness and couldn’t go to kindergarten. On these days, my grandfather stayed at home with me because he was the only adult in the family who worked the night shift. I loved days like these! My grandfather believed that our days should consist of one entertainment merging into another, and so on ad infinitum. I had no objections to his plans, and we had many fun times together. For example, we played morning exercises. The strip of carpet was taken off the armchair, and I performed gymnastics, accompanied by Grandfather’s harmonica. My somersaults, shoulder stands and half-splits never failed to be admired by my “cheerleading squad,” and I made-believe that I was a famous gymnast. Then it was time to eat. Of course, my mother or grandmother always left food for us in the refrigerator. But this food was always boring and the complete antithesis of our concept of how the day should go. So Grandfather would start to cook. All the other adults agreed that he was the worst cook ever — but I had different ideas. Our very favorite dish never lost its appeal. Grandfather had a special frying pan he had made himself and a special technique, perfect for cooking fried potatoes mixed with leftovers. Many of our family members cooked fried potatoes. but no one could do it like Grandfather, much as they tried to repeat his recipe. I tend to think that fried potatoes, like pies, absorb some of the cook’s nature, and no recipe or training can create the same effect. Even though today I have Grandfather’s frying pan, I never seem to make his potatoes — I’m still trying. Sometimes Grandfather would prepare something else, something that he ate in his own childhood, which was spent in the countryside in a time when food was often scarce. One such dish was murtsovka. 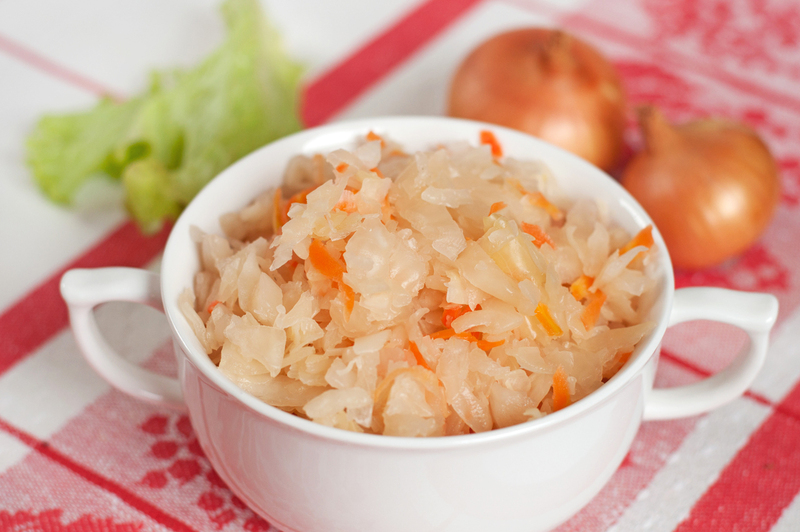 It was easy to prepare: sauerkraut was covered with cold water, mixed with chopped onion and vegetable oil. It was best accompanied by black bread. Although at first glance this dish seems barely edible, it is actually quite tasty, with an unexpected flavor and its own unique charm. Peasants used to eat such dishes during the winter fasts, especially during Lent when there was nothing left in the stores. Today it can be consumed any time, and is especially popular with those on a diet.